How do we make the healthy food choice the easy choice for kids? Evidence says garden-based nutrition education can have a big impact. This is how you can put it to work! In a time when conversations about food are so prominent in our popular culture, there also exists a lack of food literacy among adults and youth. Never before has the question, ‘where does my food come from?’ been so important as today. A troublesome food trend among youth is the growing consumption of energy-rich, nutrient-poor food, which has contributed to an increase in childhood obesity, diabetes and other diet-related conditions. According to the Public Health Agency of Canada, more than one in four children in Canada are overweight or obese. Many administrators and teachers recognize that schools share the responsibility of providing health education; at specific points in a student’s education, making healthy food choices is even a specific curricular focus. Unfortunately, due to the lack of educational resources and the difficulty of engaging students in a meaningful way, this education can have little measurable impact on students’ dietary behaviors and relationships to food. We’ve seed a classroom garden bring food education to life, providing a framework of authentic experience for deeper reflection that acts as a catalyst for deep engagement with nutrition learning. The primary goal of garden-based nutrition education is to get children to eat more fresh fruits and vegetables. Teachers across the country are using school gardens to help students explore their relationships with food and foster healthy eating practices. The capacity of the garden to engage students in hands-on, experiential and inquiry-based learning results in a higher level of engagement with food literacy education, allowing students to better internalize their learning. We’ve compiled our FAVOURITE garden-based nutrition resources to inspire healthy eating in your classroom below! The Healthy Bodies, Healthy Gardens curriculum provides experiential opportunities for student inquiry and investigation into health, earth and life sciences, math, literacy and social science. The goals of the resource are to build connections between healthy bodies and healthy gardens, stress the strength of diversity and respect for those who learn in different ways and increase the relevance of earth and life sciences through hands-on garden and nutrition lessons. Comparative taste tests provide an engaging, multi-sensory opportunity to encourage young people to try new fruits and vegetables. By asking for students’ opinions, we demonstrate interest in and respect for their preferences. Students, in return, will often become less reluctant to try something new when given the opportunity to weigh in with an opinion. Whatever the scale or purpose of your taste test, this is a tried-and-true method for inspiring curiosity and courage to try new things. Got Veggies? is a garden-based nutrition education curriculum originally developed for use in Wisconsin, though the lessons can be adapted to fit any curriculum. Many of these lessons were written for the outdoor garden, but can be adapted for use inside the classroom. Children are more likely to respond to something they can relate to. With that in mind, the Canadian Produce Marketing Association (CPMA) developed the Freggie™ Children’s Program, the youth component of the Half your Plate program. Their curriculum offers great tips to integrate fruits and veggies into the regular curriculum with little effort. The curriculum offers lesson plans for grades 1 through 6, and supports various elements of curriculum expectations from health to language arts, science and math and dramatic arts. The Nourish Curriculum Guide offers a rich set of resources to open a meaningful conversation about food and sustainability. Beautifully designed and brimming with big ideas, the materials contain a viewing guide, seven learning activities, student handouts, a bibliography, and a glossary. The Nourish curriculum and a companion DVD may be used in social studies, science, health, or English classes. This nine lesson resource is designed to teach children and their families about nutrition by relating each lesson to a garden activity. The curriculum uses the garden to integrate disciplines, including science, mathematics, language arts, history, environmental studies, nutrition, and health. Nutrition to Grow On taps into the possibilities of an instructional garden to cultivate the students’ talents and skills while enriching their capacities for observation and thinking. Explore a world of possibilities in the garden and on your plate using ten inquiry-based lessons that engage 5th and 6th graders in growing, harvesting, tasting, and learning about fruits and vegetables. Written for curriculum standards in the USA, but can be adapted for use with other curriculums. “Good” is part of the Slow Food USA’s Good, Clean and Fair school garden curriculum. In this Introduction you will find everything you need to begin gardening and cooking lessons with young learners the Slow Food way. A progression of activities that moves from the personal to the social and from the local to the global. Don’t forget to check our your provincial Agriculture in the Classroom, who each have curriculum-linked, balanced and accurate resources – often at no cost! Subscribe to receive inspiration, free resources and gardening tips straight to your inbox! 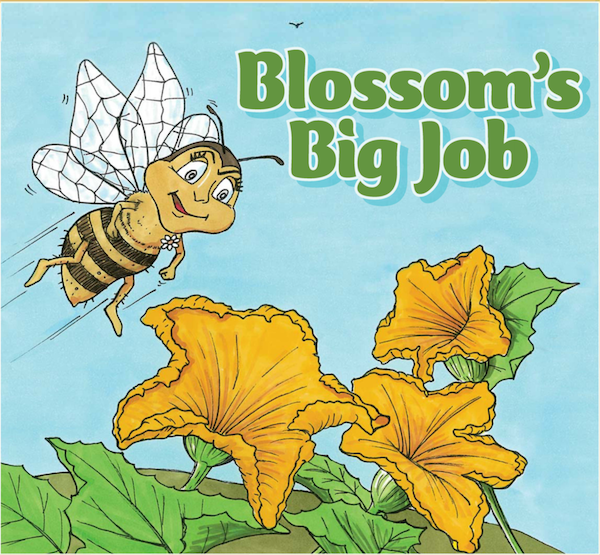 For a limited time, you'll receive a digital copy of AITC-Canada's newest illustrated children's book, Blossom's Big Job - available in French or English! Link to book downloads will be sent after subscribing. Thanks for joining, talk soon!